So things appear to be really moving along with the Garden project now, and with the help of some lovely products and plants from Homebase it is all taking shape. If you’ve been following progress so far you’ll know how the garden looked, that I wanted to create a Mediterranean themed garden, and that we’ve reviewed the fantastic Garden on a Roll. Before I showcase the finished result I wanted to give you a glimpse of what we’ve been doing, particularly how we’ve involved the children. 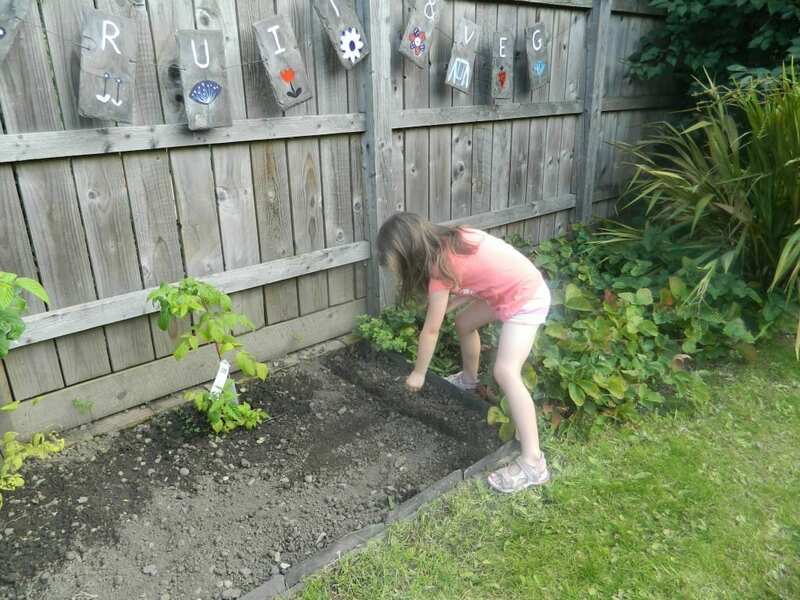 Ever since the children were very little, it’s meant a lot to me that they become involved in the garden. They’ve always had their own little gardening kits and have enjoyed helping me with planting and watering over more recent years. A few years ago we created a little plot in the garden where we could grow some fruit and veggies and we were quite successful, considering it’s not that big. 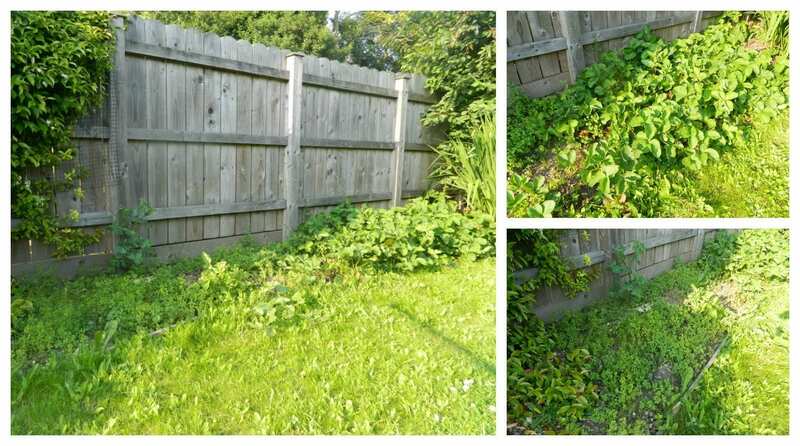 However in recent years, due to a lack of time and inclination on my part it’s become quite overgrown and I’m ashamed to show you how it looked a month or so ago. Not so much a vegetable patch, more a weed patch! 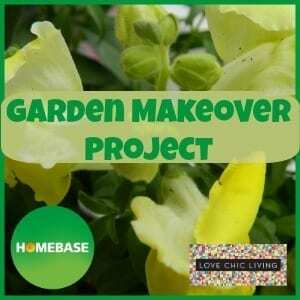 So as part of the Homebase Garden Makeover project I decided to give it a little revamp and some much needed TLC. The girls were very keen to help. Firstly we got to work and got rid of all the weeds and then decided it needed a little definition. Many years ago our Victorian house was the proud owner of an outdoor toilet and washhouse. Now when they were dismantled we stockpiled all of the original slate roof tiles and I found them stored at the bottom of the garden gathering cobwebs. As you can see from the next picture, they’ve come in very handy as an edging for the veg patch. I’m sure this will also help to prevent the strawberries spreading any further and taking over the space. 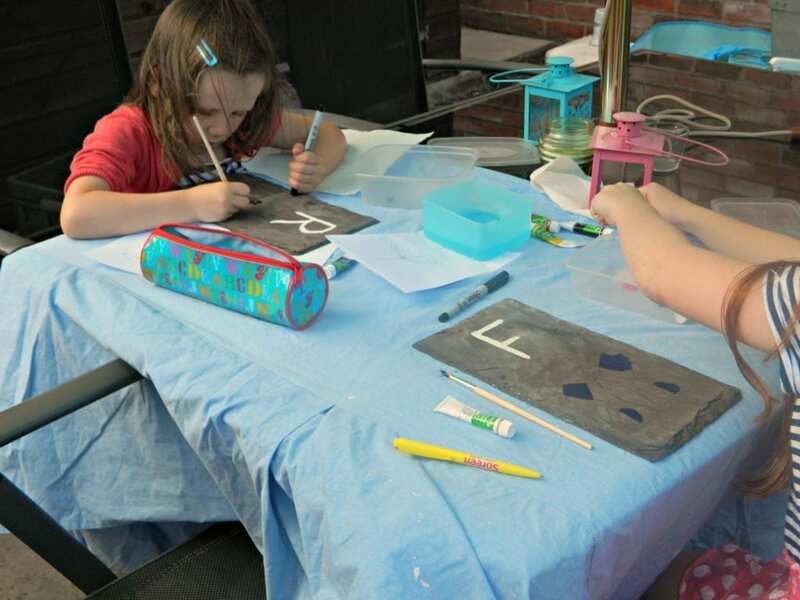 You might also notice the pretty slate bunting that the girls and I made one Sunday afternoon, with some more of the left over slate tiles. It was really easy to do and I think it has given the girls even more pride over the garden, and real sense of ownership of the veg patch. 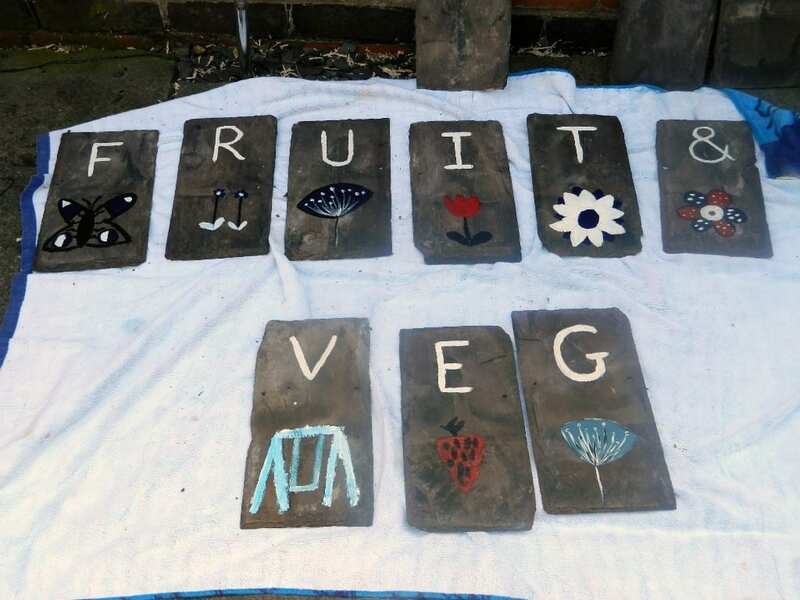 All we did was clean off the tiles and using acrylic paints from the craft box, drew on our favourite flowers and garden insects and painted them in. It was a lovely creative few hours that everyone enjoyed. Then when we were finished decorating and the paint was dry, I was able to thread some strong twine through the original nail holes in the tiles to create a bunting effect. Now it took 3 of us to carry it into position but it hung and draped beautifully above the veg patch really bringing it to life. What do you think? Since then the girls have planted in some of the seeds sent to us in the Homebase Garden on a Roll kit and we’re waiting patiently for them to grow. A few lettuces that we hope to harvest in the early Autumn months, and lots of pretty flowers to brighten up the front of the patch. Next year we will really get to grips with a few more vegetables and give it all a proper go. The plants you see in the patch already are the very lovely Tulameen Raspberry plants which featured in the Homebase Gold winning garden at the RHS Chelsea Flower Show. For now we’re just enjoying this improved corner of the garden, tending to it and nurturing it to life. Wish us luck! Thanks so much Emma, we had great fun making it! Ah now I LOVE this Jen – looks fab! I must get Kitty to paint some! Thanks so much Carolin – I did have a mild panic that the rain would wash it off, but so far so good! Thank you Amanda, yes they are out there watering the patch as I type! I really should do a post rounding it up, gives you a proper sense of achievement! You’ve inspired me now, we have some old bath tiles in the shed…. That bunting is the cutest thing. I’m going to have to give this a go once we move in to our new house! This is an awesome idea and looks fabulous! Definitely be doing this when we have a garden! Thanks so much Franki, am bowled over but the lovely comments! Wow, I just love these. A great use for old slate, both with the edging and the bunting is just fab! Thank you! I think I had a rare creative moment!! 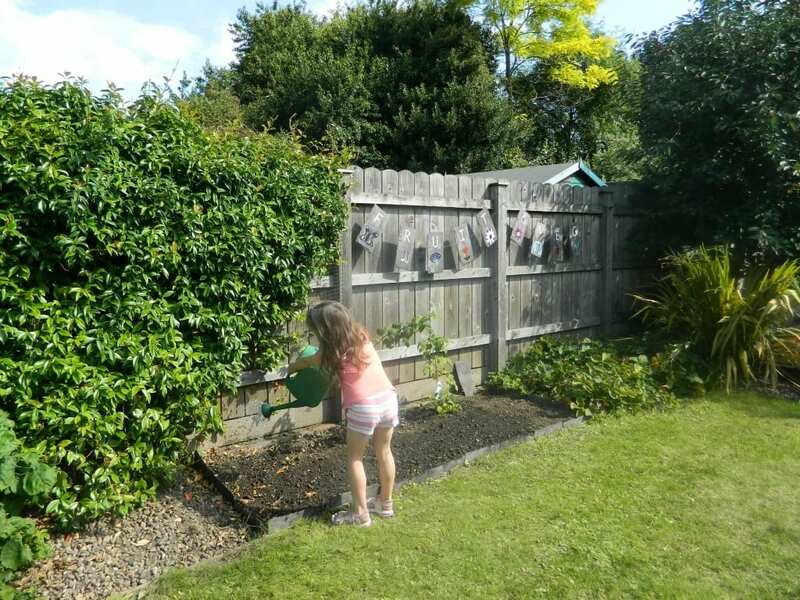 Thanks Jean, it is lovely to see the children getting interested in the garden. what a difference. and i love how the girls did the bunting! so clever and so pretty. well done! That slate bunting does look stunning. I have some salte waiting to be found a use for – no holes though. Your girls looked like they were thoroughly enjoying themselves. Popped over from how does your garden grow and will be popping back again. Great post! I love it when kids get involved! You turned a small dull space into a fab place! Good job! Great post! I love how your getting your children involved. This will teach them things like discipline and dedication later on in life. I also like the format you use for this blog. I’m currently starting a blog on “how to be funny”, but just tossing ideas around right now. What a great project to involve your kids in. I have 4 kids all under 7 and this would be a fantastic project that we could do over a weekend o two as a family. Perhaps a week when I need to mow my lawn anyway, pull out the weeds on the edge of the property and make a nice planting bed for yummy natural food to grow! Thank you again! Your garden is beautiful and give me ideas for my garden, You’ve inspired me now, I love gardening and my son too. We are building an indoor garden. Very impressive!! I hope that I more people follow in to parenting foot steps. It was a neat project that I’m sure they were proud of their landscaping effort. The best part is the got to reap (eat) the fruit of there labor. The slate idea was a neat art project touch. I hope you are continuing the garden this year. 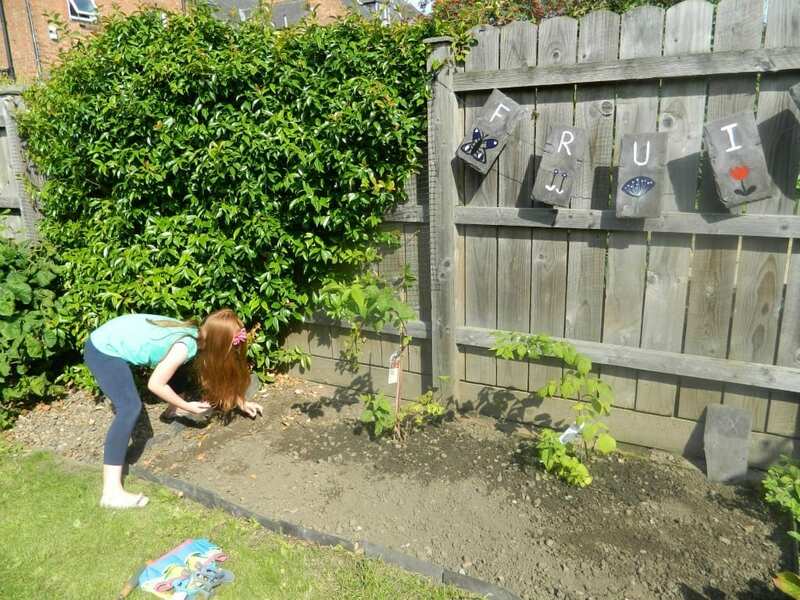 Always lovely too see children do garden activities, really like the way you designed your garden. I would really love to know how you get your children to be so proactive and excited about participating with you. i have to push my kids every week to get their chores done in our garden. Any advice would be great. 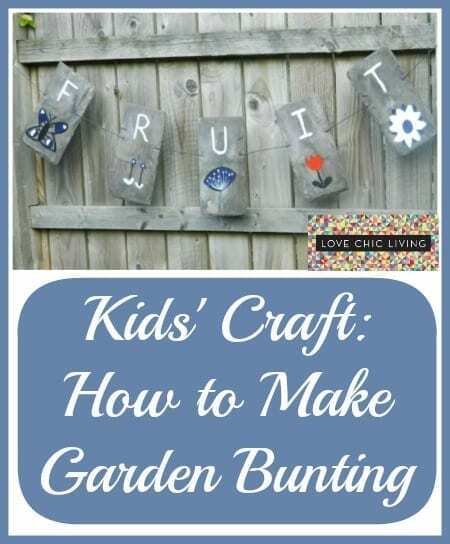 What a great way to get your kids involved in the garden! I remember making my own garden when I was a kid, all by myself. I don’t think whatever I planted was all that successful, but it was still an awesome learning experience. I’m late to the party on this post but that is a great idea. I really like what you guys did with the tiles. I’m sure my daughter would LOVE that! Were you able to keep your kids interested? Garden is looking very beautiful, love the idea. 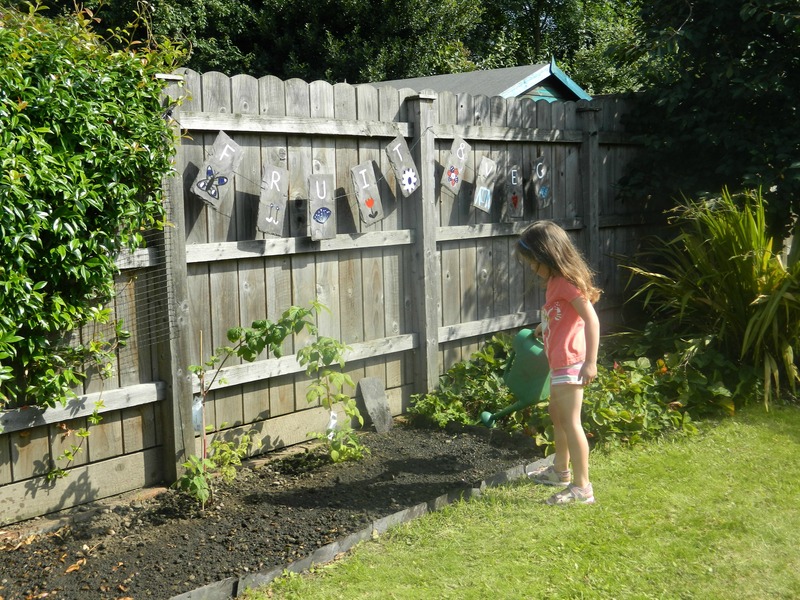 Great post with best idea to involved kid’s in the garden.